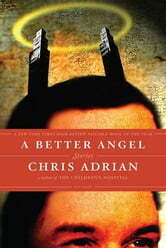 The stories in A Better Angel describe the terrain of human suffering—illness, regret, mourning, sympathy—in the most unusual of ways. In "Stab," a bereaved twin starts a friendship with a homicidal fifth grader in the hope that she can somehow lead him back to his dead brother. In "Why Antichrist?" a boy tries to contact the spirit of his dead father and finds himself talking to the Devil instead. In the remarkable title story, a ne'er do well pediatrician returns home to take care of his dying father, all the while under the scrutiny of an easily-disappointed heavenly agent. With Gob's Grief and The Children's Hospital, Chris Adrian announced himself as a writer of rare talent and originality. The stories in A Better Angel, some of which have appeared in The New Yorker, Tin House, and McSweeney's, demonstrate more of his endless inventiveness and wit, and they confirm his growing reputation as a most exciting and unusual literary voice—of heartbreaking, magical, and darkly comic tales.